Private 16598 2nd. Coy. 6th Bn., Lincolnshire Regt. 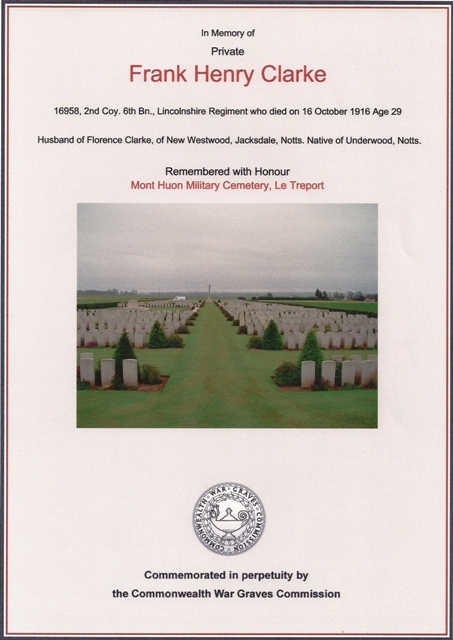 Died Monday 6th October 1916 aged 29. At Rest: Mont Huon Military Cemetery, Le Treport, Seine-Maritime, France. Grave ref. : II. G. 2. A resident of Jacksdale, originating from the neighbouring village of Underwood, on Christmas Day 1912 Frank married Florence Duckmanton of New Westwood at St. Mary’s Church, Westwood. At time of marriage his occupation was given as miner and his residence as Brinsley, Notts. It does not seem that Frank and Florence had any children. Frank enlisted at Mansfield during May 1915 and on 12 December 1915 embarked for the Balkans. He was wounded in France and taken to the hospital centre at Le Treport, dying of his wounds on Monday 16th October 1916. His widow was sent his personal effects amounting to £1 12s 10d in February 1917 and a war gratuity of £6 in October 1918. The Commonwealth War Graves Commission gives his service number as 16958, but his Medal Rolls Index Card lists his service number as 16598. Frank was a recipient of the 1914-15 Star and the British War and Victory Medals.